Bertie could we start by asking the big question that the public need to know…are you single? Well now you cheeky thing there’s a leading question if ever there was one ……….. I am yes but I am spoken for by the most delectable Mollie Apso. (Have you seen her she is just gorgeous!) We haven’t met as yet but we do speak daily on Twitter. Could you tell us a little bit about your personality, what are you like to live with? I am extremely happy chap, I tend to love everyone and everything (unless I’m on my lead). 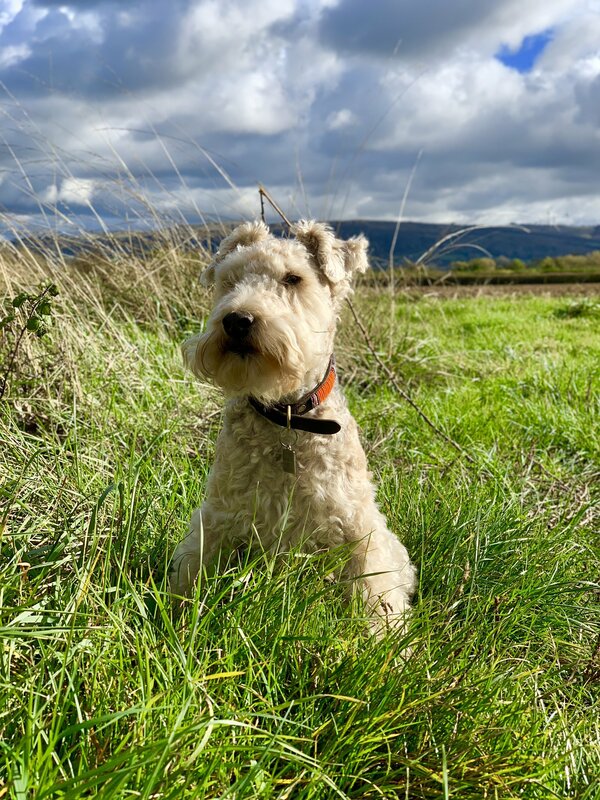 Being a Lakeland Terrier very little phases me, I am extremely adaptable to all situations. As I was pushed to start work at an early age (10 weeks) I am used to travel and being in different environments and tricky situations. As a hound at home I am very very easy to live with I have heard the phrase ‘a total joy’ whispered. Do your stunning good looks create problems for you or have you got used to it? Rumours are that you can get in trouble from time to time….would you like to comment?! It has at times been mentioned that trouble is my middle name but I’m not sure that we should go in to it in too much detail. There was of course the incident where I fell 40 feet down a cliff on Leckhampton Hill, then the time I manged to get covered in mud from head to toe in the meadow. Do you enjoy humans? What about little humans? Would you rather they got off your couch and left you in peace? I love humans and little humans if they let me get to know them my way. I like to investigate slowly and carefully taking in all off their smells poking them lots with my nose and giving them a bit of a lick, but if they are the sort that come straight in with a hand to my face there is a risk of a nibble . If I’m happy with them they can do anything to me, pull my tail, chase me, pick me up and I love to play. Do you work out? If you don’t mind me saying you look pretty fit. I am guessing you like to run. So you’ve noticed?! Well my passion is to chase pals who chase balls or just chase pals ……….. so there you have it, it’s the best work out an dog can have! Where do you stand on the great cat debate? Does the postman bother you when he brings the fan mail? I actually rather like the postman at home, I do enjoy a little grrrrrr at him now and then. However the Postman at work is a different beast, he comes roaring in the yard in his van not a care in the world so I have been known to give chase and give him a harsh peace of my mind. We heard you had a recent injury have you fully recovered? I heard you need grooming quite a bit, would you say you are high maintenance? Dare I say diva! Now wherever did you get that information from I wonder, is there a snitch in the camp?! I need very little grooming, a brush three or four times a week is fine which takes less than 5 minutes a go. I have double coat and I don’t moult so I am a very very low maintenance young man. However I have been known to carry out a little styling work on my beard and moustache just to stay ‘on trend’. If you had to describe yourself in three words what would they be? What are your favourite hobbies? Sometimes dogs are not as lucky as you. Are there any rescues or shelters that you admire to recommend to my readers. Oh Dogs trust and Terrier SOS! I spend my pawket money to sponsor less unfortunate dogs then myself! Well there we go folks the legendary Bertie Lakeland!What a great sport. We really apreciated the contribution. We love following you and keeping up with your antics.